Wow, what an honor! 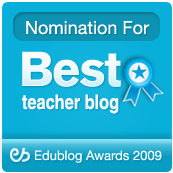 My blog is now on the short list of Best Teacher Edublogs for 2009. I’d like to thank Brenda Landis for the nomination. Please head over to the site to vote for your favorite blogs! Voting ends Wednesday, December 16. By the way, I also encourage you to vote for Chris Francese’s Latin Poetry Podcast, which was nominated for the Best Educational Use of Audio. Chris was extremely helpful to me when I was writing my book. He helped me translate Euler’s original article (pdf) from Latin. We also wrote an article about Euler’s proof for the American Mathematical Monthly.